At Lyndale Optical, we strive to provide our patients with the best eye care services possible. Located in Bloomington, MN, we are a locally owned optical business, providing eye exams, eyewear and contact lenses to the Twin Cities' south metro area for more than 15 years. 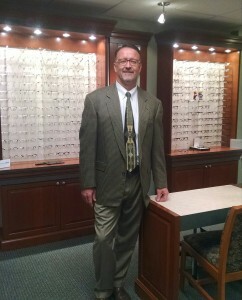 We have a large selection of name brand eyeglass frames and sunglasses. Dr. Steve Tonner was born and raised on a farm in Iowa. He attended the University of South Dakota for his undergraduate and attended New England College of Optometry in Boston, MA. During his free time, Dr. Tonner enjoys golfing, riding his Harley and his two Labrador hunting dogs. At Lyndale Optical, we believe that early diagnosis and treatment of eye and vision problems are important for maintaining good vision and eye health. Walk-ins are always welcome. Call Lyndale Optical today to schedule an appointment and ask about our smiles for life program!